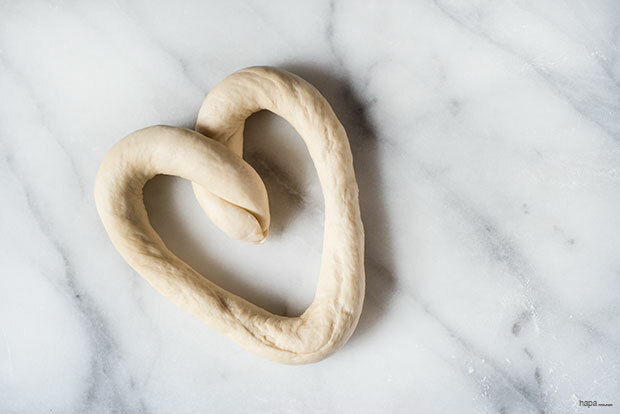 Give your love a piece of your heart this Valentine’s Day with these Cinnamon and Sugar Heart Pretzels. Valentine’s Day is one of those unique holidays that for most, either brings out the romantic or the cynic in you – generally depending on your relationship status. I’ve been on both sides of the coin… numerous times… more times than I care to think about. Dating can sometimes feel like you’re participating in some twisted version of the Hunger Games. Over the years I’ve paid my dues in the love department, but you know what – it was all worth it. Almost 2 years ago, I married my best friend and the love of my life. Now don’t worry, I’m not going to get all mushy on you – that’s just not my style. I may have found my love, but for me, Valentine’s Day isn’t all about candles, flowers, and fuzzy puppy dogs… well, maybe the puppy dogs… I’ll take those any day. For me, it’s all about the food. To be more specific, it’s all about the sweets. Full disclosure, I’m actually not a big sweets persons, I’m really more of a savory kinda gal. But these Cinnamon and Sugar Heart Pretzels have well, a soft spot in my heart. 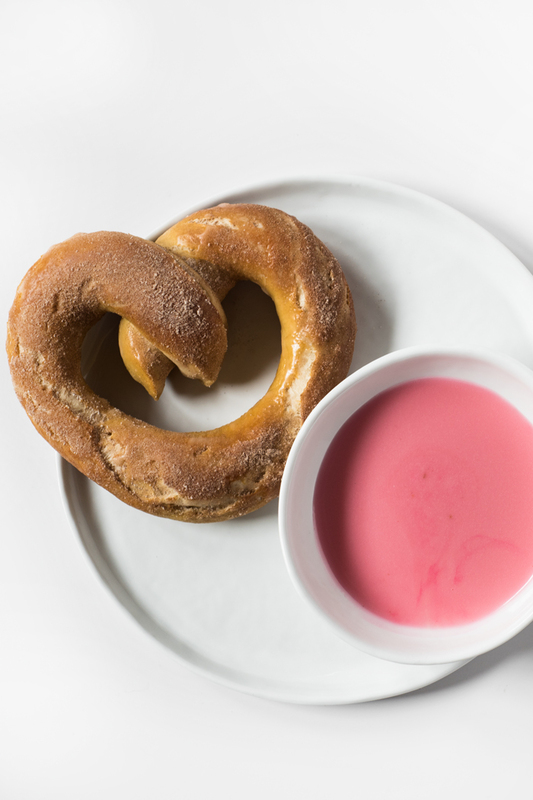 This Valentine’s Days, give yourself and those you love, a warm and delicious Cinnamon and Sugar Pretzel Heart and have a very happy Valentine’s Day. 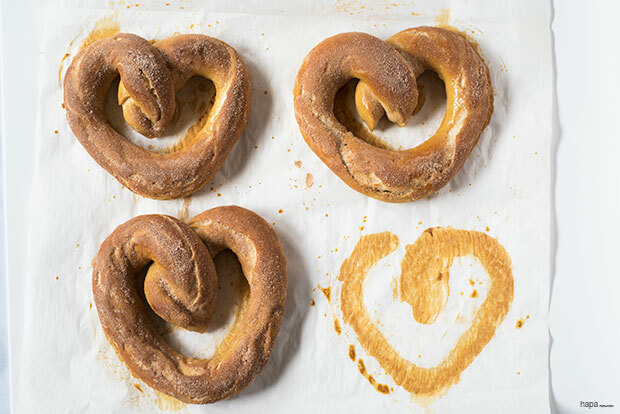 Give your love a piece of your heart this Valentine's Day with these Cinnamon & Sugar Heart Shaped Pretzels. Combine the water, sugar, kosher salt, and butter in the bowl of a stand-up mixer and sprinkle the yeast on top. Let stand for 10 minutes, or until the yeast begins to foam. Add the flour, using the dough hook, mix on low speed until fully incorporated. If the dough is too wet, add one tablespoon of flour at a time. Increase mixer speed to medium-low and knead until the dough is smooth and pulls away from the sides of the bowl, and is no longer sticky, approximately 4-5 minutes. Transfer the dough to a large oiled bowl and cover with a moist tea towel. Let it sit in a warm place for 1 hour. While the dough is rising, prepare the icing (recipe below), but do not add the food coloring until you're ready to serve. At this time you may also mix together the cinnamon and sugar in a small dish, set aside. Bring a large pot of water and the baking soda to a boil. In the meantime, punch the dough down and remove the dough from the bowl. Divide the dough into 4 equal pieces and then half each piece again, so you will have 8 pieces. With a moist tea towel, cover any dough you are not immediately working with. Taking one ball of dough from under the tea towel, roll it out into a 22-inch rope, applying even pressure with your hands. Make a U-shape and bring the end up and twist and pinch to form the top portion of the heart. Gently press the ends together and transfer the pretzel to the parchment-lined baking sheet and cover with a damp tea towel while you work on the remaining pretzels. Place the pretzels, two at a time, into the boiling water for 30 seconds, splashing the tops with a spoon. Remove with a wide spatula or spider (they will be slick, so be careful with transferring) return to the parchment-lined baking sheet to rest - you may reshape them to some degree if needed. Brush each pretzel with the egg wash. Place in the oven and bake for 15 – 17 minutes. Transfer to a cooling rack for at least 5 minutes. Brush the pretzels with a thin coating of the white icing (a little goes a long way) and then sprinkle generously with the cinnamon and sugar mixture. Add a drop or two of food coloring to the icing and stir to combine. Serve with the pretzels and enjoy! Sift the confectionary sugar into a small bowl. Add the corn syrup, vanilla extract, and water. Stir until fully combined. Add the food coloring after you have glazed the pretzels. I have a dumb question! Does the icing recipe you used harden? Or does it remain dippable? I’ve decided to make Pink Ribbon Pretzels!! Not dumb at all! In fact, I should make a mention of that in the recipe. The icing does stay dippable for quite awhile. However, give it a few hours and it will harden to a shiny frosting. AWESOME idea to do Pink Ribbon Pretzels! I have a few friends that are breast cancer survivors that would LOVE those! This is such a fun idea! I love the cinnamon sugar- it reminds me of my kids’ favorite Auntie Anne’s. And that pink icing is just so festive! Great recipe Kathleen! love this idea! Will be sharing it on FB for my friends to see also! These are amazingly creative, Kathleen! And so cute and pretty! (especially that irresistible pink icing … swoon!) I loved your thoughts about Valentine’s day, too. Is it right, so much baking soda 2/3 of a cup? But it looks devine! Will try it soon! Hi Ólöf. I know 2/3 cup of baking soda sounds like a lot, but that is the correct amount. You want a very high pH level (very alkaline). Originally this was achieved with lye – but lye is highly corrosive and requires gloves and googles. The use of lye creates that deep brown crust and distinctive flavor you get with pretzels. An easier (and safer) alternative for home cooks, is to use a high ratio of baking soda to water. Kathleen, I’m a sucker for heart shaped foods for Valentines day! awh loved hearing that you married your best friend and the love of your life. yeah, it took some time for me to find my prince charming. . and went through some bad eggs along the way! ;P anyway, love these pretzels! hope you guys have a happy Valentine’s Day! These pretzels remind me of the ones I used to make with my mom when I was very young! Unfortunately we didn’t make the pink dipping sauce…I love that!! Aww… I love dishes that bring back wonderful memories 🙂 So sweet. This is such a cute idea and they do sound addictive. I love cinnamon sugar pretzels and these look adorable! What a fun idea to make pink dipping sauce! Beautiful pictures as always! Thanks, Mira. I’m a sucker for heart-shaped food on Valentine’s day. Omg, did I seriously list American? I did, didn’t I? My husband, being born in Germany would shame me 😛 Not to mention, we’re flying to Germany next week! I guess that’s what happens when you’re posting late at night 😉 Thanks for the heads-up! OMG! These is so amazingly adorable! 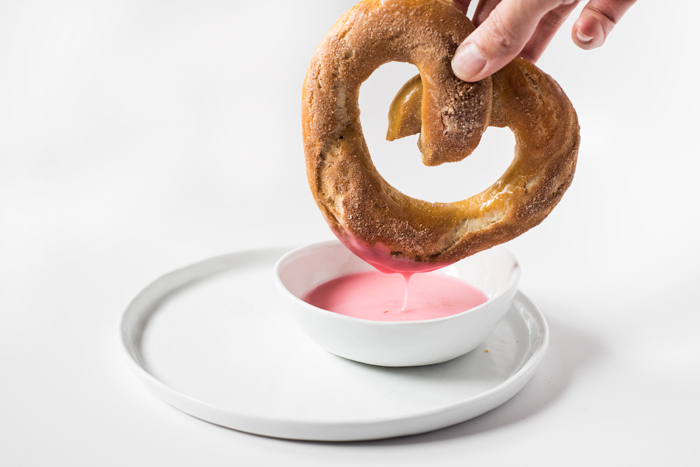 Who ever would have thought of a pink icing dip with heart shaped pretzels except for YOU?! You rock!